Marketing Agency Banner Ad Templates – HTML5 Animated Created by InfiniWeb. This templates have specific characteristics, namely: Marketing has features such as Compatible Browsers: IE10, IE11, Firefox, Safari, Opera, Chrome, Edge, Software Version: HTML5, Google Web Designer . 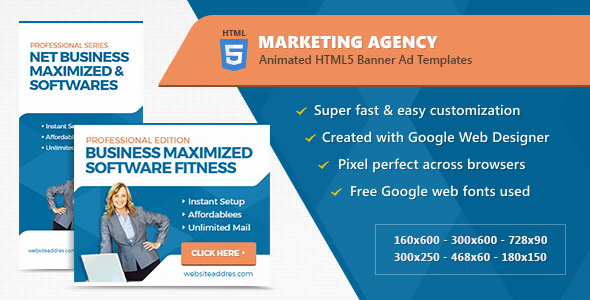 You can use this Marketing Agency Banner Ad Templates – HTML5 Animated on Html5 category for ads, advertising, adwords, animated, banner designs, banners, business, corporate, doubleclick, finance, google web designer, html5, technology, templates, web banners and another uses. The stock image is not included in the download file, it is for demo purposes only. Visit istockphoto.com or photodune.net?ref=mildtheme?ref=mildtheme’ for a great selection of images.